Zamboanga City - The Department of Labor and Employment Regional Office No. 9 (DOLE RO 9) launched its 24/7 Hotline for Zamboanga Peninsula on September 9, 2016 in Zamboanga City. In the DOLE Administrative Order No. 409 series of 2016 issued by Labor Secretary Silvestre H. Bello III, and consistent with President Rodrigo R. Dutertes' directive to ensure timely delivery of services to the public, DOLE RO 9 through the leadership of Regional Director Sisinio B. Cano, immediately set up a 24/7 Hotline Call Services to provide immediate response to all workers in crisis and emergency situations requiring urgent assistance and relief from unsafe, unhealthy, and unjust conditions of work. The Hotline Call and Text services cater the needs of the victims of illegal recruitment and trafficking-in-persons, separated workers claiming unpaid wages and benefits, workers engaged in temporary or atypical work arrangements not in accordance with existing labor laws and regulations, local and overseas workers claiming social and health insurance benefits within the jurisdiction of DOLE,workers inquiring about applicable wages and wage related benefits such as minimum wages, overtime pay, holiday pay, and similar concerns, and workers with cases filed in DOLE offices, attached agencies and POLOs claiming unpaid wages and benefits. 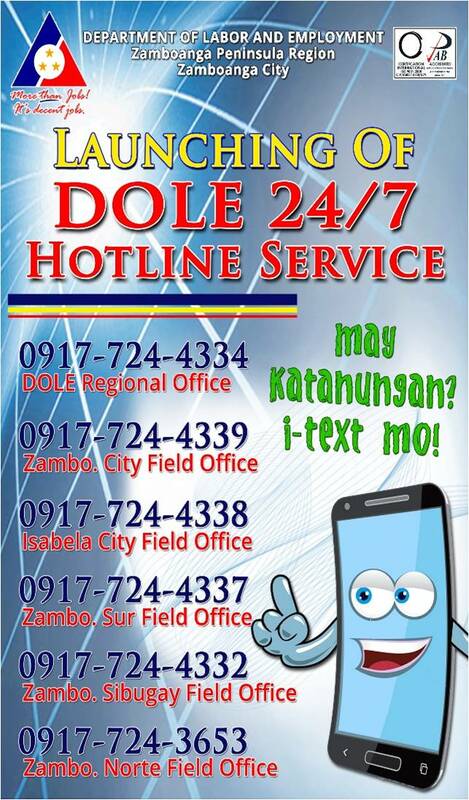 The HOTLINE CALL SERVICES shall serve as the backbone of an intended computerized, fully integrated and accessible 24/7 DOLE information and emergency dispatch system for Labor and Employment related concerns of workers.